So you want to play android games directly on your personal computer (PC). You want to experience and run your favourite games and apps on your pc? If this is your question and interest then I’d like to say that you arrived just in the right place because here in this post we are going to discuss the best ways to run and play android game on your computer. As we all know about this (Android) leading operating system. There are tons of useful apps and interesting games of both types i.e Free and paid. These games and applications are built in order to run on your mobile device having Android OS. But here what if you don’t have a mobile phone with the particular operating system? Or suppose that you’re building an android app/game and want to test and experience your app/game on computer. For this purpose, few great software are build that let you play android games on your pc. What you’ve to do is to download one of these apps and install so you will be able to do so. I would like to remind you that we’ve shared some other topics about android that is how to make own web-browser for android free, best android apps for foodies, Best ways to download youtube videos to android and hope that these were helpful for you. The purpose to remind you these is to let you know if anyone is missed from you so you will read it now. I don't want to waste your time anymore and let you get bored while reading the post. Below we're listing the ways and softwares that let you install and play android apps and games on your computer. Firstly, I think you may already be familiar with bluestacks or even you just may heard about this great tool. Actually, Bluestacks is an android emulator letting you play android game on your computer having either a windows or Mac installed. Bluestacks enables you to download android apps and games form its official playstore or any other market as well as you'll be able to download HD games and install it on your computer. Downloading and installing bluestacks on computer is pretty much easy and is just like a piece of cake:-) what you've to is to follow the instruction described in below easy steps. Step-1: First of all download bluestacks from this LINK. Step-2: After download completes, run the downloaded program and click continue. Also make sure to Checkmark both of 'App store access' and 'App Notifications'. Step-3: After the progress completion, you will see the bluestacks installed and a shortcut named "Bluestacks" appeared on your computer's desktop. Just hit this and log-in with your google account details. Now you can use bluestacks to run and play android games on your computer. you can search an app directly from bluestacks's search bar. 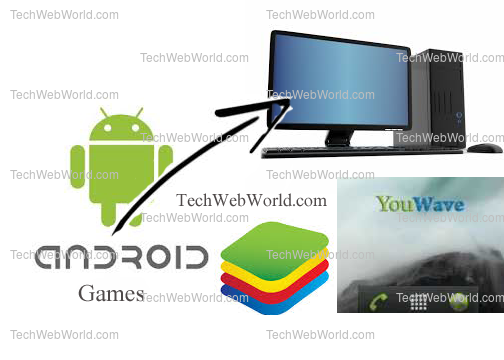 Youwave is an android emulator having the ability to run & play games of android on pc. But unlike the bluestacks, this is not a free tool. You can download its free trail for 10 days to experience the games on pc of android. Installation process of youwave is also very easy. First of all, download it from its official website and then install on your computer. so you will be able to experience android games on pc. So in this post we discussed two way to play android games on your pc. I hope now you will be able to enjoy your favourite android games on pc without having a mobile phone having android OS. Also please do share this post on your social profiles and let you friends know too. Where you're getting the problem? Please explain what message appears?